It was Good Friday, 50 years ago on March 27, 1964, that according to seismologists, the snow peaks of Prince William Sound jumped 33 feet into the air and fell back down. Emergency warnings about an earthquake-spurred tsunami went out to towns from Valdez, Alaska, to Malibu, Calif., but no one thought to send a message to the Chugach Natives in Chenega, Alaska. Chenega chief Nikolas Kompkoff watched the mountains leap and the waters around his island disappear over the horizon. Knowing the water would return with a vengeance, he ran his four daughters up a hill toward high ground. But the nine-story-tall tsunami was moving too fast for their little legs. Kompkoff made a decision: He grabbed the two girls closest to him, tucked them under his arms and ran up the slope, leaving the other two to be seized by the wave. Days later, a postal pilot on his weekly mail drop could not find Chenega because every single house ”“ and a third of the residents ”“ had been washed out to sea. When he circled back to the site he saw the village’s church on the hill with survivors waving. Kompkoff found the body of his youngest daughter stuck in the high branches of a pine tree. He buried her, then left to join the survivors, all refugees scattered throughout Alaska. 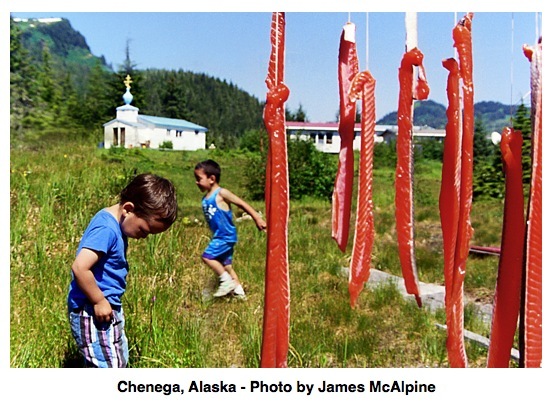 The government told the village of seal hunters they could never return. No longer able to hunt, Kompkoff became an Orthodox priest ”“ and a notorious drunk. On Good Friday each year, Father Nikolas would return to his island with the remainder of his flock to place a cross among the broken sticks of the old village. Each year he swore they would rebuild. The years passed, and the oath to rebuild seemed increasingly ludicrous. 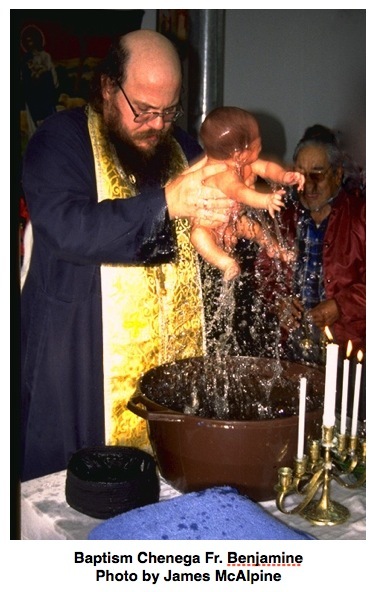 After a decade of helplessness, Father Nikolas put a gun under his chin and pulled the trigger. The bullet passed through his jaw. Embarrassed church bishops defrocked him in response. On Good Friday, 1989, the 25th anniversary of the earthquake, Kompkoff led his congregation (they still considered him “Father” Nick) in a commemoration of the tsunami’s dead at the church they built at New Chenega. The village had been resurrected stick by stick by Kompkoff’s nephew Larry Evanoff after Evanoff returned wounded from Vietnam. What the celebrants did not know was that that very night another tsunami would head toward them, a wave of oil from the Exxon Valdez. As the oil slick spread from the grounded tanker through Chugach waters, Exxon made the Old Chenega area what the industry calls a “sacrifice zone.” The company’s executives allowed it to be slathered by tons of crude. The official answer was that the bones were undisturbed. In fact, as I reported in my book, Vultures’ Picnic, both the oil and bones were being scooped up by Exxon bulldozers at that very moment. The Chugach hired me to investigate the spill’s true cause and true culprits. Paul Kompkoff asked me to arrange a secret meeting with Exxon in hopes of getting a few dollars so the new village could survive. In particular, the Chenegans wanted Exxon to hire them to clean up the beaches and fishing grounds still contaminated with Exxon’s gunk. In 2010, I returned to Prince William Sound for British television. On the Chugach’s islands, I picked up gobs of the “oil that ain’t there” in my (carefully gloved) hand. 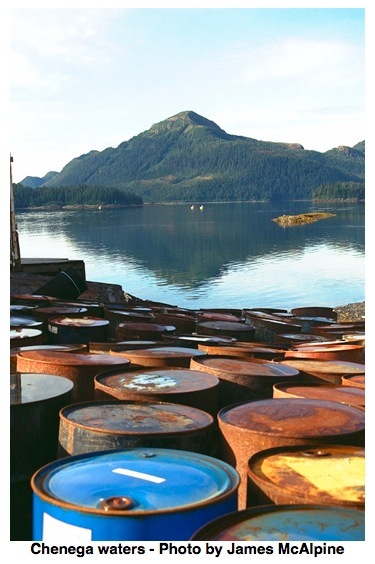 It was more than two decades after the Exxon Valdez spill. Then I flew down to the Gulf of Mexico where I collected giant hunks of Deepwater Horizon oil nearly a year after the spill ”“ more “oil that ain’t there,” at least according to our government and BP television ads. In 2011, 22 years after the Alaska spill, Exxon paid for the damage ”“ but only after the Supreme Court cut the payout by 90 percent. Part of Chenega’s money was meant for a new fishing boat for Paul Kompkoff. But he was long dead by then, as were a third of my Native clients.. I was in Chenega on the second anniversary of the Exxon spill. Paul Kompkoff and I snacked on dried salmon while we watched the first Gulf War on CNN. The U.S. Air Force was bombing the bejesus out of Baghdad. 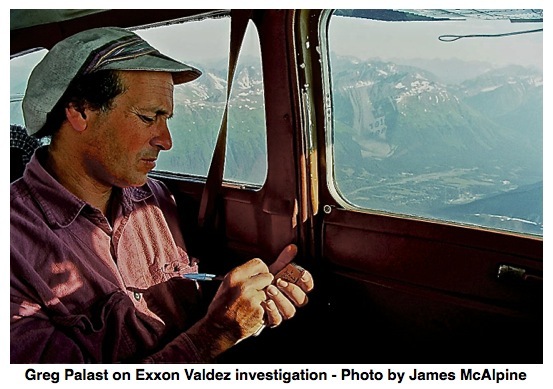 The story of Greg Palast’s investigation of the Exxon Valdez, Deepwater Horizon and other tales of corporate carnivores is found in his book, Vultures’ Picnic. His investigations, from Alaska to the Amazon, are contained in his new film, Vultures and Vote Rustlers. Greg Palast is also the author of the New York Times bestsellers Billionaires & Ballot Bandits, The Best Democracy Money Can Buy and Armed Madhouse.